CSUN Model UN team following their victory for representing Ethiopia at the National Model United Nations conference in Washington, D.C., Nov. 5, 2017. Photo courtesy of CSUN Model UN. 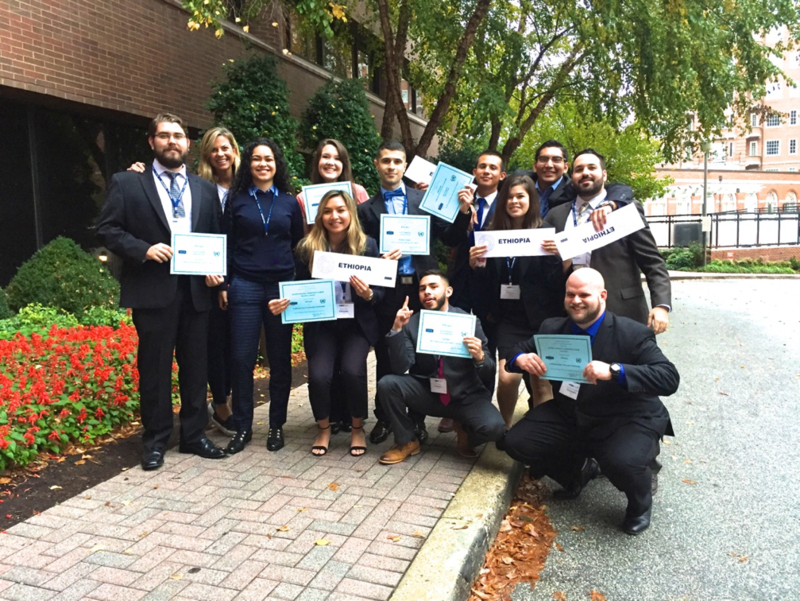 For the fifth year in a row, California State University, Northridge’s Model United Nations (UN) team earned the top recognition at two prestigious conferences. The 2017-18 student team, led by head delegates Jaelin Palmer and Milad Salami, won the “Outstanding Delegation” award — the equivalent of placing first — for representing Ethiopia at the National Model United Nations conference in Washington, D.C., in early November 2017. Later that same month, a team of 14 CSUN student delegates competed for and won the top award at the Northwest Model United Nations conference in Seattle, Wash. — beating schools like Stanford, UC Berkeley and UC Irvine. Model UN, a student-led experiential learning program that serves as a labor-intensive course and club, is an opportunity for students interested in enhancing a myriad of skills, such as research, writing, debate, speech, collaboration, professional and diplomatic skills. Before the conference, CSUN’s Model UN requests a country for team members to represent on a specific committee, such as sustainable development, reducing nuclear weapons or confronting sexual violence. The competition also included public speaking and working in committees to solve challenges. The Model UN students graduate at the top of the political science department, and many go on to graduate school, law school and enter high-profile careers such as international relations and consulate work, said political science professor Jennifer De Maio, who has taught the Model UN class and served as the team’s faculty advisor since 2013. “Experiential learning programs allow students the opportunity to take the knowledge they have been building … and really apply it to real-world situations,” said De Maio. Members of Model UN are expected to attend class once a week for five hours, complete weekly research along with supporting position papers and participate in mock trials. The Model UN program is funded by Associated Students and an Instructionally Related Activities (IRA) grant, which is a student fee designed to provide practical experiences outside of the classrooms for students. Callos has been a member of Model UN since her first semester at CSUN and is looking forward to serving as a head delegate for the spring semester. This past fall, Callos acted as a veteran member, assisting other Model UN members with preparation for the national conferences. The CSUN team plans to compete at the upcoming international New York competition this spring as the Democratic Republic of Congo. The Model UN program is open to all majors. To learn more about the program, please email demaio@csun.edu.